So I’ve been meaning to write about this for a while, it’s been sitting in my draft folder for 5 months and I finally decided I feel okay to start sharing my thoughts about how I deal with anxiety and to share some insights that I’ve personally found useful. I’ve also received some amazing support, advice and strategies from my parents;(who are both experienced psychotherapists) along with hearing many other peoples stories and experiences too. I want to start with a disclaimer and say of course I am no expert as I will be mainly sharing a few tips on what I’ve found have been helpful to me. Although there are some similarities about how anxiety manifests, as it shows up in many ways and each of us will have preferred ways of managing it too. Growing up I didn’t want to talk about these things and would hide them from others, yet over time I realised it’s something that a lot of us share and through my conversations with my friends I’ve realised how common it is, yet also realised how sad that there is limited and straight forward education about it. So over the last few years I’ve found the more we talk about these issues, the more we may help each other or allow each other to all feel less alone whilst dealing with these things. I’m hoping sharing some of this with you may either create more open dialogue about it, where we can all talk and support one another (my messages are always open for any of you) or perhaps the tips may offer something that you could try that may help, like they helped me. Anxiety is an experience with many symptons and the word anxiety is just one limited way we use to describe something which happens to us on lots of levels. So using one word to try and describe an abundance of thoughts, feelings, sensations and behaviours is inevitably going to leave us confused. Breaking all this down into bite size chunks was the first real step for me in understanding. The following is in no particular order, as where anxiety usually starts is deeply personal for each one of us. But for me, firstly changing the way I thought about anxiety was most useful. This is obviously something we all do, whether we think in terms of stories or images. The gift of creative thinking and imagining is incredibly useful, however this creative thinking can be a curse when we imagine the worst. Once we are creating worse case scenarios, images and stories in our mind, we are actively telling our body and brain that there is actually something bad that is, or might be going to happen. And if we do this often enough the brain and body believes that the stories and imaginings are real and then the body starts to respond as if it were actually real. Yes, the brain doesn’t always know the difference between fact and fiction. Of course factual scenarios can be appropriately scary, however adding more story telling can often intensify the feelings I am having. Previously I used to call my experience of anxiety an ‘anxiety attack’. Yet I no longer call them that or associate anxiety with an ‘attack’ as I would tend to create more worry or fearful thinking, which would only escalate the feelings I was having. So when I feel the physical symptoms of anxiety I no longer think about an ‘attack’ or ‘panic’. My body may be reacting in a powerful way but my fearful thinking was only telling my body and brain that I was under threat. Along with scary thoughts there would be a good mix of scary feelings too, such as feeling nervous/scared/fearful. So next up was not just understanding what I was feeling but what were all these weird sensations that were going on in my body. When we are in an anxious state our bodies are generally moving into a ‘fight or flight’ response. We know this because our heart rate goes up, we get hot or cold, we may shake, want to be sick, feel faint, breathe very fast etc. Again this is because our brain/body has either perceived actual (factual) threat or perceived (imagined/fictional) threat and adrenaline kicks in. This adrenaline is the chemical in our bodies that gets the heart moving faster and it activates blood flow toward the muscles. The reason for this is that if we are under threat (fact or fiction) we need to get out of the situation, hence ‘fight or flight’ we either need our body to fight the situation or run away from (flight) the situation. This is why the adrenaline is released. (There is also a freeze response that can also happen under extreme stress/trauma, but I may explore that in another blog). Now of course this fight/flight response is great if we are in a life threatening situation but if it’s a result of stress for whatever reason or being late for a date, then its not so helpful. The other problem is that when a lot of adrenaline is released into the body the blood flow goes to the muscles and not to the brain. This is why we feel spaced out and cannot think straight when in this adrenalised state. Also feeling sick is because the body wants to be lighter to run or fight so the body wants to get rid of whats in the stomach. Breathing very fast is because our bodies are preparing to move fast. One of the worse things to do is to sit and be still in a highly adrenalised state, the best thing to do is to move around, dance, jump, run for a few mins. This will then move the adrenaline as the brain then knows that the body has done its job. If you are unable to move, imagine running and sometimes this can also help. Here’s a few more tips that I find useful for me. 1. Eating a substantial breakfast is really vital, whilst avoiding stimulants like caffeine and high sugars. Breakfasts with healthy fats and proteins with vedge based carbohydrates are ideal. Keeping our blood sugar levels balanced throughout the day prevents the body producing unnecessary adrenaline as a false fuel, as skipping meals will produce more adrenaline especially when we are running low on energy because of the lack of food and lack of essential nutrients. Quick fix sugars only exaggerate feeling more stimulated/anxious. 2​. Visualising: This is dependant on the situation but closing your eyes and visualising another place or paying attention to the things around you and focussing on the ‘facts’ of whats happening and your external environment. I play the colour game usually, as I find my moments happen when I’m travelling, so I usually look for colours,focusing on 4 red things, 4 blue and so on. However, for some people I know that reading things can also help in these moments. On the train for example, I spend a lot of time reading the small print of the signs to help focus my mind on things around me. ​3. ​Create your safe place senses: My mum introduced this strategy to me to create a safe place senses ‘box’, ‘notebook’ or even place on your phone with notes of a list of things that help you feel relaxed or to help us in these moments. For example, I have podcasts I love listening to on my phone and meditations, I have drawing apps to take my focus off of them, I have a book I’ll take with me when going into situations that may make me feel anxious. I bought myself a mindfulness colour book that I draw in before going out if I’m feeling like I may be going into a situation that I may find anxious. Of course, it’s down to finding things that work for you in these situations, but try creating a list of strategies that allow you to feel relaxed and work on them as a resource . ​4. Chewing gum: Now I have to say I’m not saying to chew gum or chew something whilst you are highly adrenalised as this could cause you to choke and I’m only suggesting this as it’s something that’s helped me. But if I feel as though I’m going into a situation that may be stressful, I carry a pack of gum or mints on me and chew them before going into the situation. It’s known that chewing reduces levels of stress hormone cortisol found in saliva and fast chewing has been shown to have more of an anxiety busting effect than slow chewing. Some people I know also say that the chewing has helped them feel less anxious as it allows them to focus on the chewing and stops teeth grinding in stressful situations. ​5. Question/ visual Game, with others or alone: If you are alone and experiencing any of the symptoms of anxiety, try the question game. Work your way down from 5 and in your head or if you are able to out loud say 4 colours that you notice around you, 4 smells around you, 4 things you can see, and 4 things you hear. Then work your way down from 4, stating 3 colours, things you see, smells and things you hear. This allows your mind to focus on the physical things around you, to focus your mind and attention onto something else. If you are with someone who may be having anxiety symptoms or you are experiencing them and need support, it’s okay to ask someone to help you with these questions. If you are the one supporting another, ask questions about things they’ve done (such as “what did you have for breakfast”) encouraging them to move their attention away from the internal experience of anxiety and start to notice the external world around them. ​6.PIES: Going through these points/exercises help me acknowledge where my anxiety is originating from. This can be helpful when the symptoms are moderate. P/Physical – How is my body experiencing the adrenaline? I/Intellect – Are my thoughts fact or fiction? E/Emotionally – How do I feel? 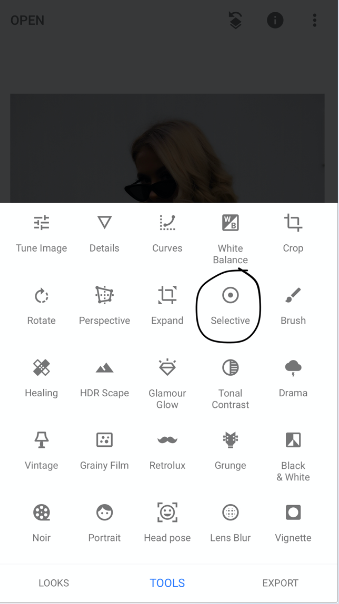 S/Socially – What do I need to regulate? ​7. Do what eases anxiety symptoms. It is different for everyone, but find something that allows you to feel at ease and involve these moments into your days or the upcoming days you may feel stressed about. Relaxation methods, such as yoga and meditation are good ways that allow your body to relax and to stop your adrenals from overworking. ​8. Plan short term activities throughout your days, that are enjoyable or focussed in a way that brings your attention away from what might be causing you worry. For example, If you are spending more time in your thinking, do some movement and body based exercises. ​9. Challenge your expectations and social media norms: For me a lot of my anxiety stems from situations I cannot control and I feel distressed when I don’t think I can control an outcome. Over the last few months I have been working daily on consciously doing one thing that is out of my routine by doing things that aren’t planned or in my control. Some small examples of mine are planning to see someone on the day, rather than in advance. Accepting that I don’t have control of others and letting my expectations go. Not checking my phone for an hour and taking time off my phone when feeling anxious or stressed is also something that helped me massively. Our bodies are stimulated when scrolling and looking at a blue light on a screen which again overstimulates our nervous systems and stops us from resting. So I found taking time off scrolling and not being constantly plugged means we give our bodies the down time they need. 10 Be kind to yourself: Anxiety is not always just about the psychological and is very often an adrenal response that is caused by many stressors that are outside of our control and part of the pace of daily modern life. Just because I don’t feel ok doesn’t actually mean it’s me that is actually not ok. Our bodies are good at giving us feedback and if we listen we may make life choices that enable us to live in more balanced ways that will support our bodies/ brains and nervous systems, which will naturally reduce anxiety and adrenaline symptoms. Thanks for reading this post, I really hope in some way this was helpful and know if you ever want to chat my messages are always open. Have a lovely day! My new favourite drink and super cute event! 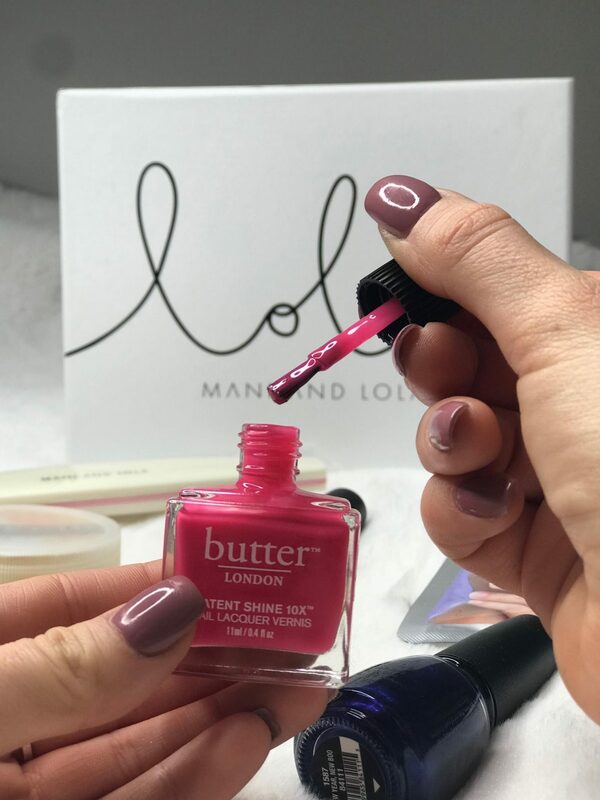 Just writing a short but extremely Sweet blog post today about a little event I attended that I really wanted to share with you all! 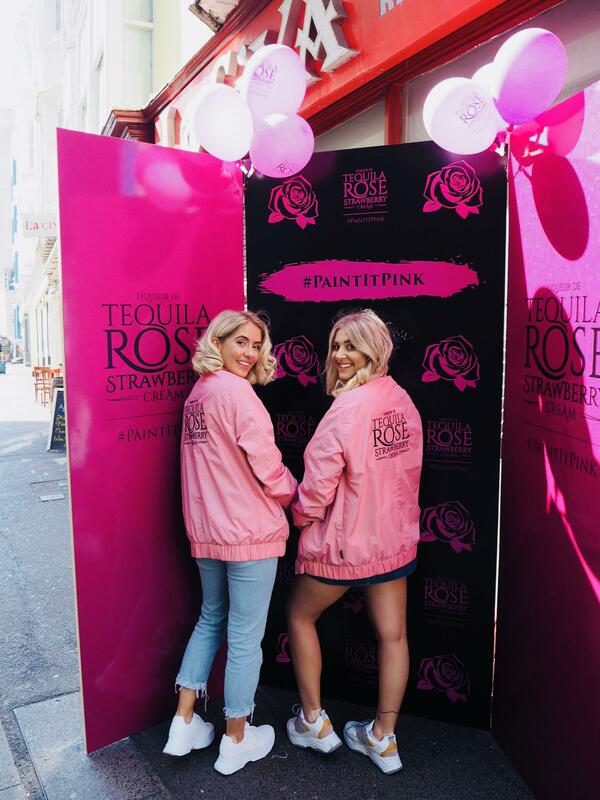 Last week I was really lucky to be invited to try the new Tequila Rose in Brighton, along with my bestie @AliHemsley ! Now at first I was honestly thinking am I going to struggle to drink it? Tequlia has always been to strong for me, but oh my goodness!!! This strawberry cream liqeur is incredible. It’s pink, it taste amazing and the bottle looks absolutely beautiful! 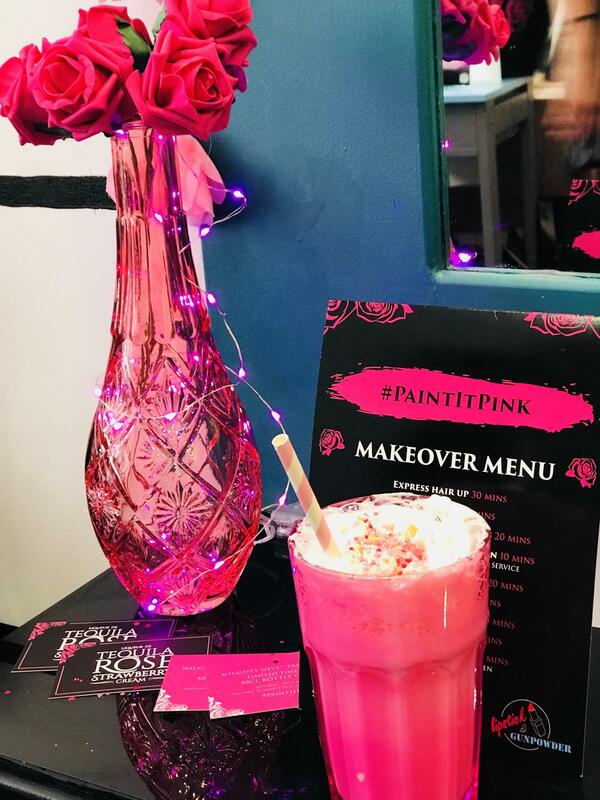 So I did really spend my Saturday in pink, drinking pink things and getting super excited about finally finding my new favourite drink. I tested this drink with all my friends this weekend, and they all loved it as much as me! 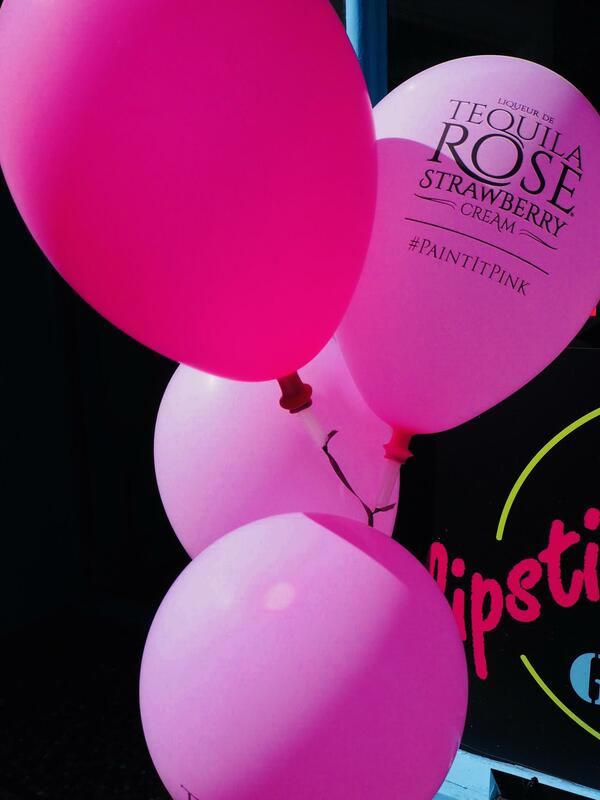 So I’m super happy that it now means all pre drinks can be Tequila Rose! I guess you could say I really am in love with it. 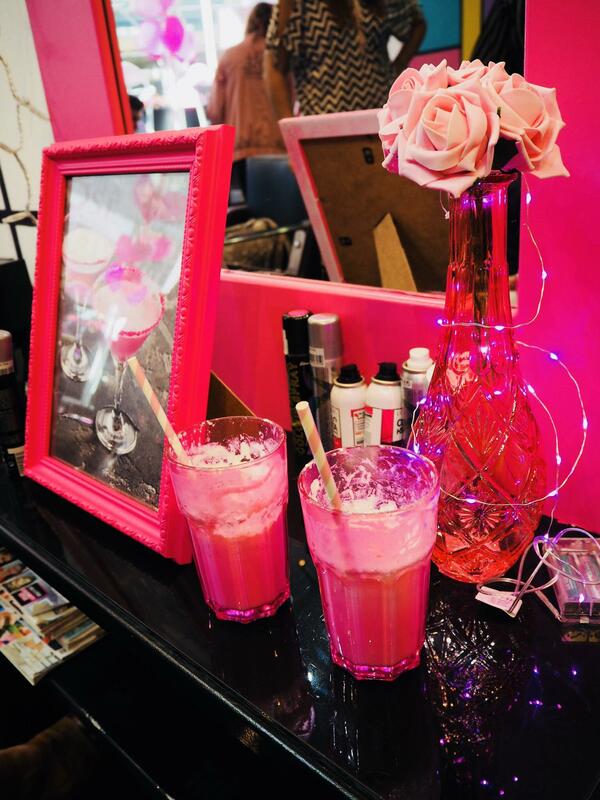 The day consisted of getting our hair done at Lipstick and Gunpowder in Brighton and drinking the most amazing Tequila Rose Milkshake, which I really need to attempt to make! 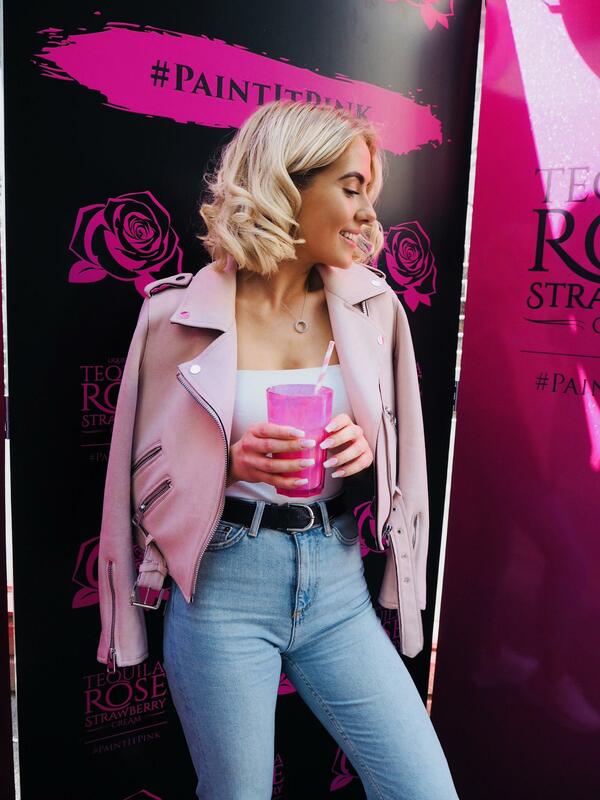 Whilst having my hair curled into the most stunning bouncy waves we had lots of yummy shots and then decided to take full advantage of the colourful background and super cute tequila rose backdrop! 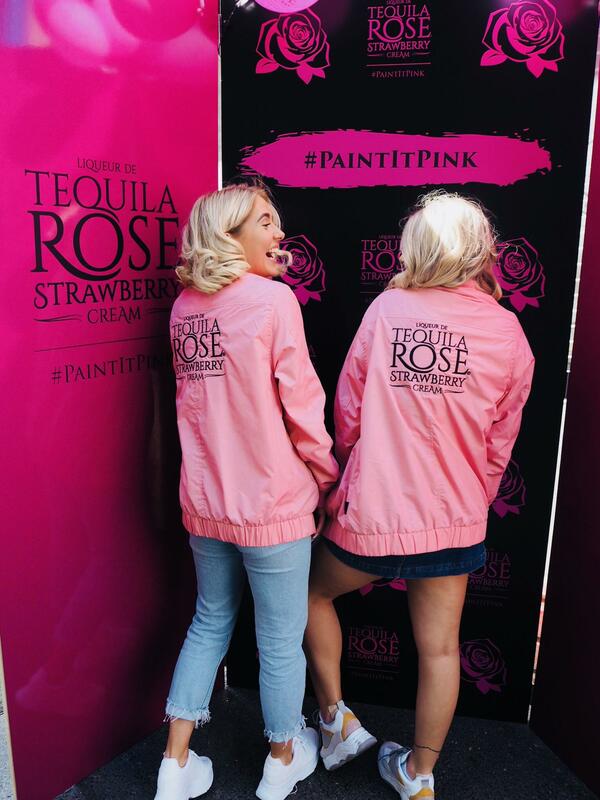 Ali and Myself decided to borrow the coolest pink jackets that made us feel like we were part of the pink ladies gang.. pink ladies tequila gang in fact and had such fun catching up in the sun. The best way to describe this drink is like an alcoholic milkshake! It’s so so yummy. Honestly everytime I smell it I want a sip…but it’s not really expectable to have a drink on a work night in bed by yourself. It really is such a perfect drink for summer! 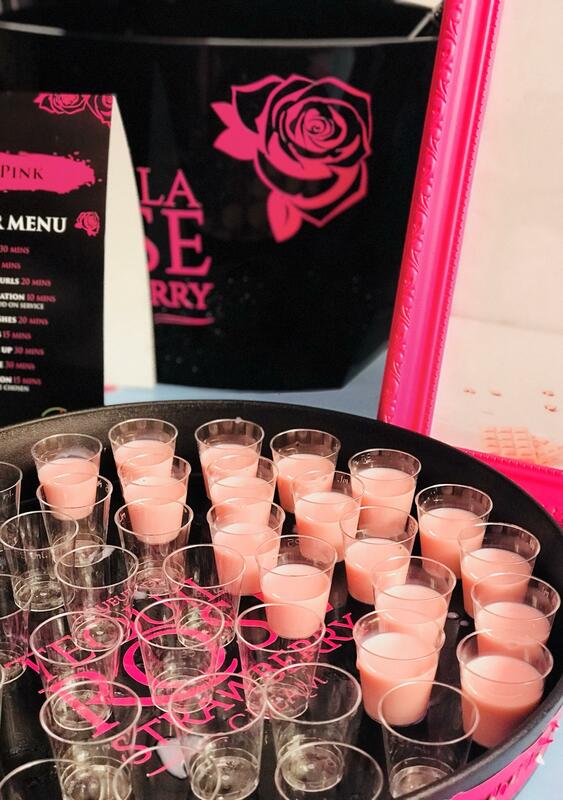 For shots with friends, a milkshake or even tequila ‘beer pong’ that me and Ali decided to play for her birthday this weekend, which is 100% nicer than beer in my opinion! 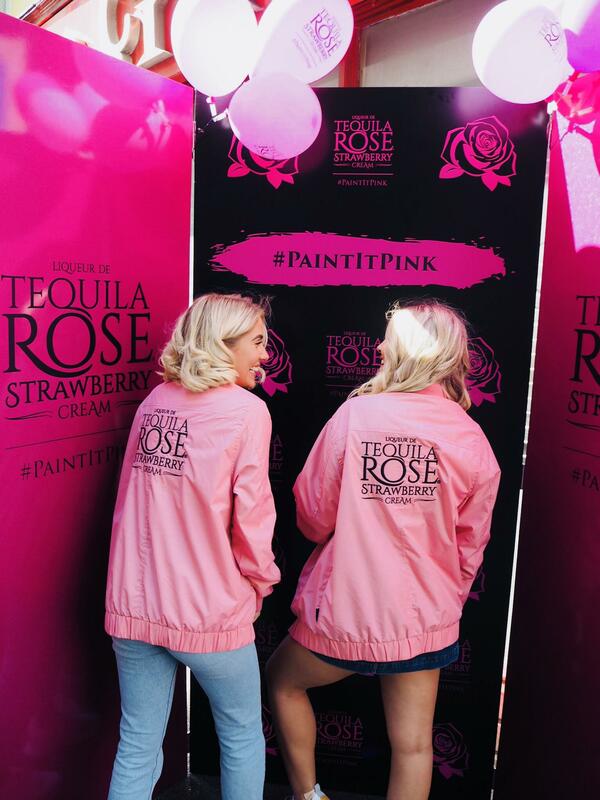 You can buy Tequila Rose from Tesco’s and its so so worth it, I promise once you add this into the mix on your nights out you’ll thank me for it! Let me know if you’ve ever tired it or if you do after this! *This is a sponsored posts. All my honest thoughts and opinions. Tips on dealing with the stresses of social media and learning to love yourself. “To be beautiful means to be yourself. You don’t need to be accepted by others. You need to accept yourself.” ~Thich Nhat Hanh. Hope you’re all happy and well! I thought I’d create a post today about how I personally deal with some of the stresses of social media and ways in which I am learning to love and accept myself. I’m only writing this because I believe as inspiring and amazing as social platforms can be, they can also be mentally draining for a lot of us who are part of this virtual world. We are all human, and I feel as though a lot of the time we do and try to constantly show all the positives and share only the positive moments. However for me personally, I do have difficult days and I am in no way complaining about how incredible social media is and how many wonderful opportunities it has opened up for me. So just to make sure this post isn’t about me complaining or talking about the negatives, it’s more to highlight that we are all human and social media can sometimes affect us. Below are a few different ways I cope with it all. It can be overwhelming and so hard not to compare yourself when you are constantly surrounded by everyone’s highlight reels, so I am trying hard to learn how to release self-neglect. I am a firm believer that you can create your world by working hard, putting your all into it and being positive about everything you create. I also believe it’s okay to have those down days and be open about the things you go through – it doesn’t mean your moaning if you need to express how your feeling! So I wanted to share some ways I personally deal with the stresses of social media and how it can sometimes make me feel. As I am sharing so much of my life online already, and will only continue to share so much more over the next few months and years, I want to make sure I am always honest and open with you all and will share as much as I can on my thoughts and tips with how to deal and enjoy this journey. So, here goes… Here’s some of the things I’ve been doing lately to allow myself to have down time from social platforms and learn new ways of self-love and accepting myself. Starting the day with love, not technology. Reminding yourself of your worthiness in the morning. Don’t go on your phone as soon as you wake up. 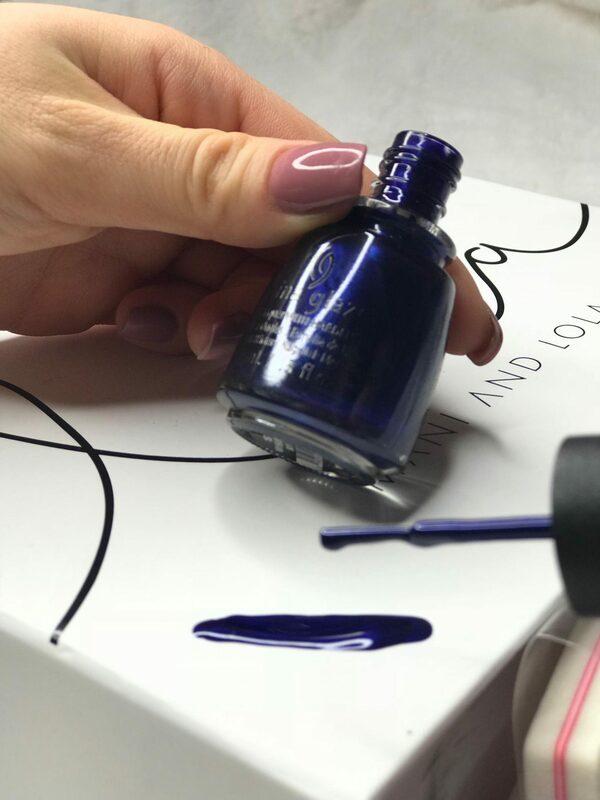 Give yourself an hour for your body to wake up slowly before flicking through social platforms – it’s not going anywhere, you won’t be missing out, promise! It honestly helps so much with feeling relaxed. As going on your phone as soon as you wake up can be such a shock to the system as its such an over stimulant. Give yourself breaks from constantly checking your phone. Find something that allows you to switch off. For me personally, it’s going to the gym. I don’t have any wifi there (thank goodness – a little blessing) so it means I can just listen to music and switch off from it all for a bit. MY suggestion would to be to consciously turn airplane mode on and do something for yourself, for part of your day. This could be anything – cooking, planning what you are going to do the next day, going for a walk or spending time with loved ones. Follow accounts that inspire you, not ones that you find yourself comparing too. As I see it, you may just need a bit of space from following that person sometimes. I am in noway criticising them, but it’s simple, everyone shows their positives, their proudest moments or shares all the things they love. However, it can be extremely unhealthy and also damaging for us to spend some of our time comparing ourselves to someone elses best moments. I know I’ve been guilty of this, I have moments where I don’t feel like this and moments where I do. Just look out for yourself, as we can sometimes do it without even realising. There is a big difference to admiring/ being inspired by someone and feeling envious and constantly finding yourself picking at your own features or lifestyle because of having an insight to someone elses. We are all unique and everyone is on their own journey, so enjoy yours. Time off before you got to sleep. Try give yourself an hour or two before bed to not go on your phone. Recently, I’ve been writing in a note pad and filling it with ideas I have that I want to start creating after university, I think it’s important to allow yourself to relax before sleeping! Listening to music or reading is something that also helps me sleep better at the moment. Talk about how your feeling, if you feel affected in any way. It’s okay to talk about it all, social media has so many positives but also can have so many uncertainties and worries that occur due to it, and it’s okay to take time out to focus on what is right for you and be in the moment. Surround yourself with people who make you happy and be in those moments with them, not always living it through your phone. I also want to briefly touch on numbers, followers and engagement. As I know a lot of us can be affected by this. I have always tried to never ever focus on any of those things as it’s something you don’t have full control over, but I understand it is something that does feel like recognition/ a sense of achievement to things we create through social media sometimes, but we shouldn’t let it. Our platforms are a place where we are able to be creative, and share our love, whatever it might be with others. It’s a very inspiring place however, we need to remember why we started sharing these in the first place. 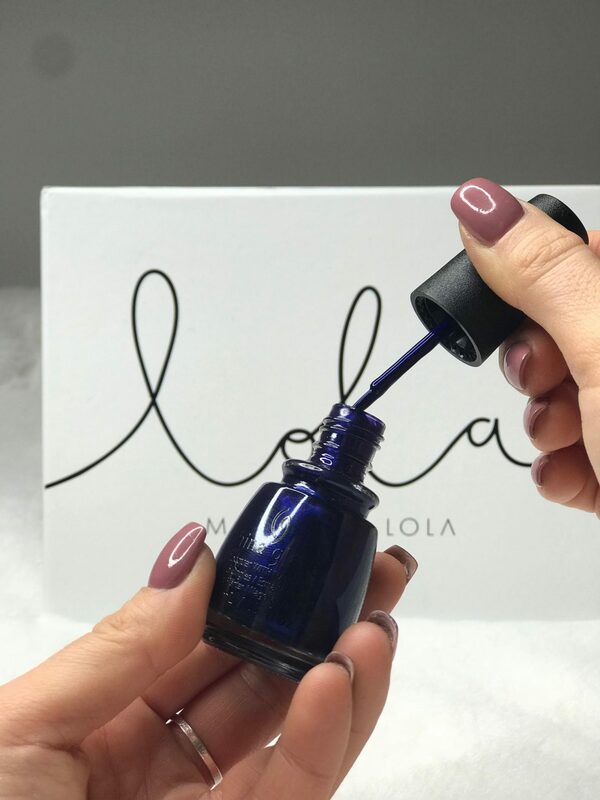 When I first started blogging, I ended up stopping for 7 months because I began to feel constantly down about what I was doing and that it wasn’t ‘good enough’, so I stopped. I took time out to have my space and think about why I wanted to pursue this in the first place, and for me that time was so helpful as it brought me back to all the reasons I wanted to do this. So do what is right for you. Allow yourself to step back if you need that time, you need to feel happy and positive towards what you create. Talk happy to yourself. If you can, try and think of 3 or more things daily that you feel you’ve accomplished and things you love about yourself. Although I found this difficult to start with, I believe it really helps you focus on a positive mindset towards your body and your mind. Be patient with yourself and appreciate/ think about the things your grateful for when you can. We can only do so much and it’s good to listen to your body, to allow yourself to relax and focus on doing the things you love. When it works for you, it’s good to have time to reflect on some of the things you’ve accomplished and what your grateful for. Talk to someone, or seek professional help. Dealing with self-rejection and stress can be extremely difficult, and we all deserve to be happy. From personal experience, I think it’s important to try tune in and work out what you may need, and if seeing someone may help with that support in your life then it’s something that’s worth exploring. There are lots of different approaches you can make to this, so it’s always good to try different things and if they don’t work move on and try something else. I’ve tired a few different things regarding therapy to help with the ways I deal with stress, and am still learning and trying new things, such as yoga and meditation. Talking to people can also help, such as friends or family. If you are reading this and want to chat, I will always be more than happy to talk to any of you as a friend (I’m no professional) but sometimes it can help just to let it out in the open. I want to thank you all for reading this and sticking around to be part of this journey with me! I will always be honest and true with you all. I am forever grateful for all of your support and love. 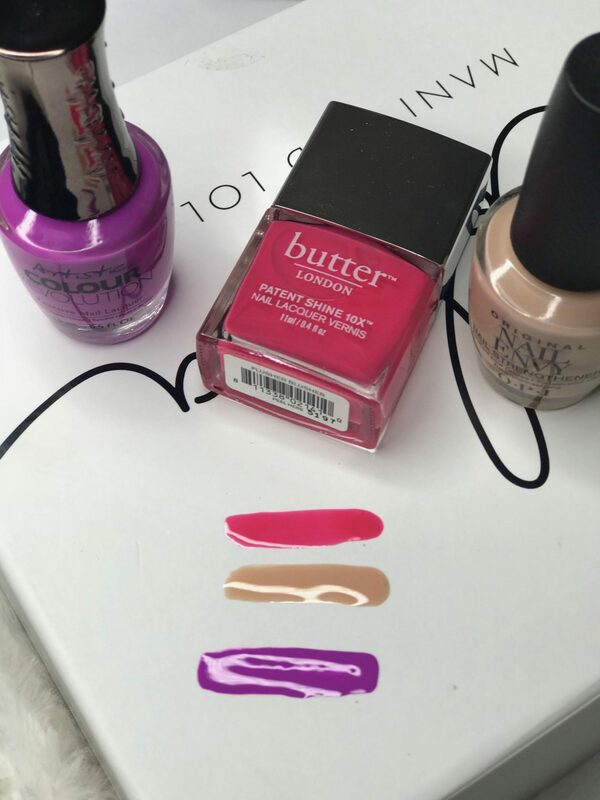 I thought I’d do a little post about the sweetest January treats I received for my nails and hands this January. 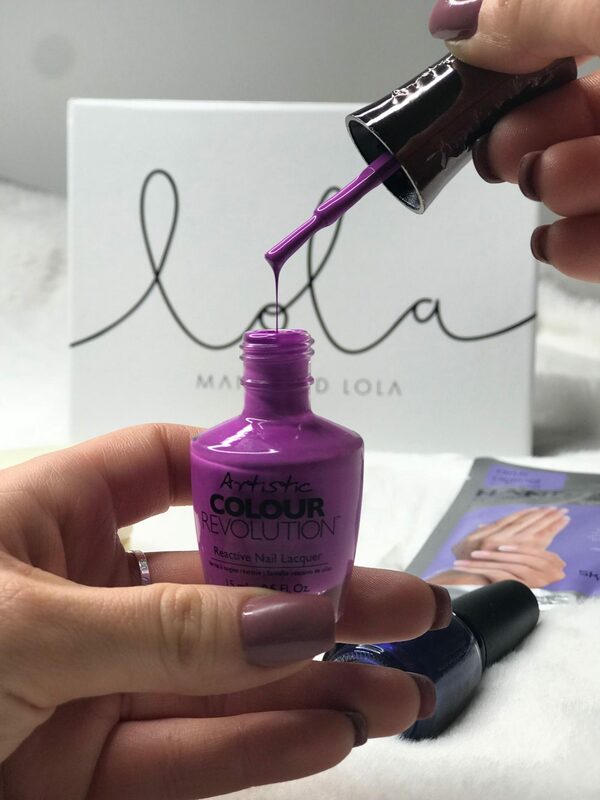 I’ve always wanted to have healthy and long nails and throughout winter my hands get so so dry and I also have the worst habit of biting my nails when I get stressed or anxious! 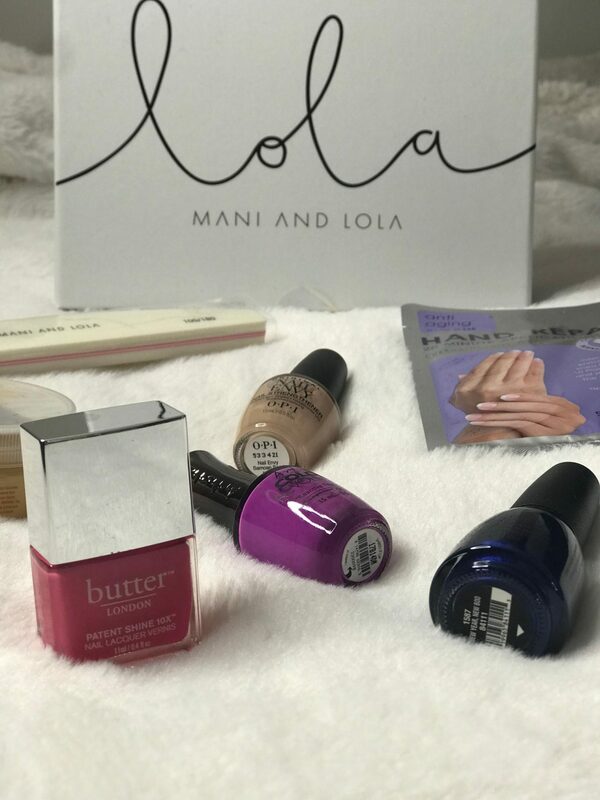 So when I received this box from Mania and Lola I was so excited and amaze by some of the products, I felt like I had to share them with you all. 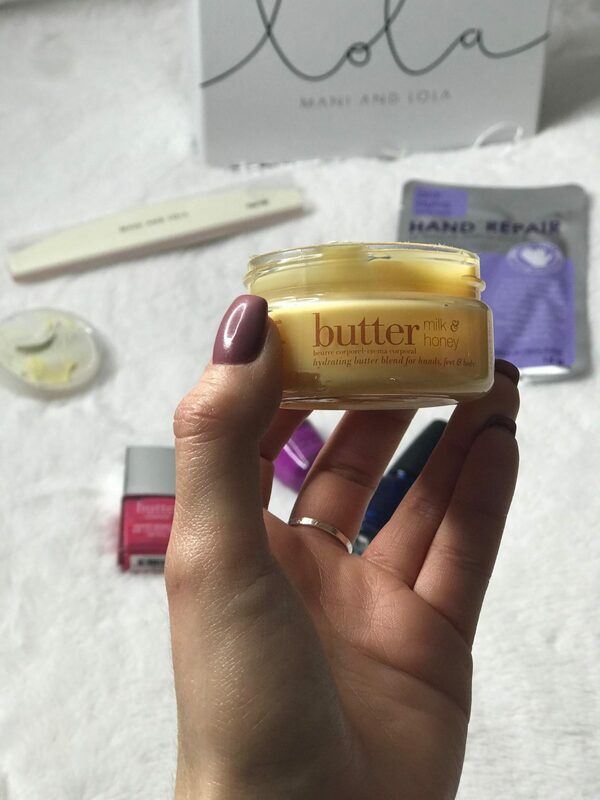 Within my box I recieved an beautifully smelling hand repair ‘Intensive Hand Mask’ by Skin republic and the most perfect little on the go pot of ‘Milk and Honey Body Butter’. January and February has been so cold and can be so harsh on our hands. Just yesterday when I went for a walk, my hands turned so pink and big from the cold they looked weird! So having these littles treats in your bag for those moments, is so so perfect. 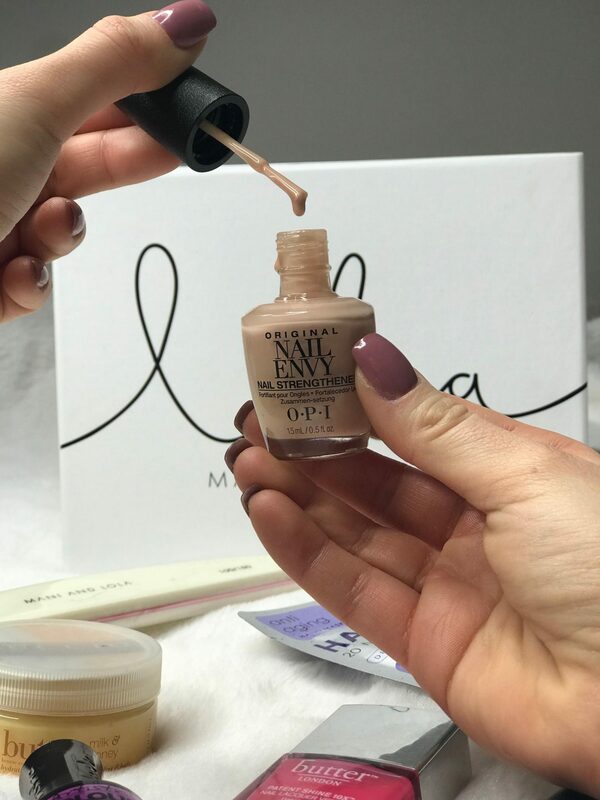 Keeping my hands super nourished and soft! 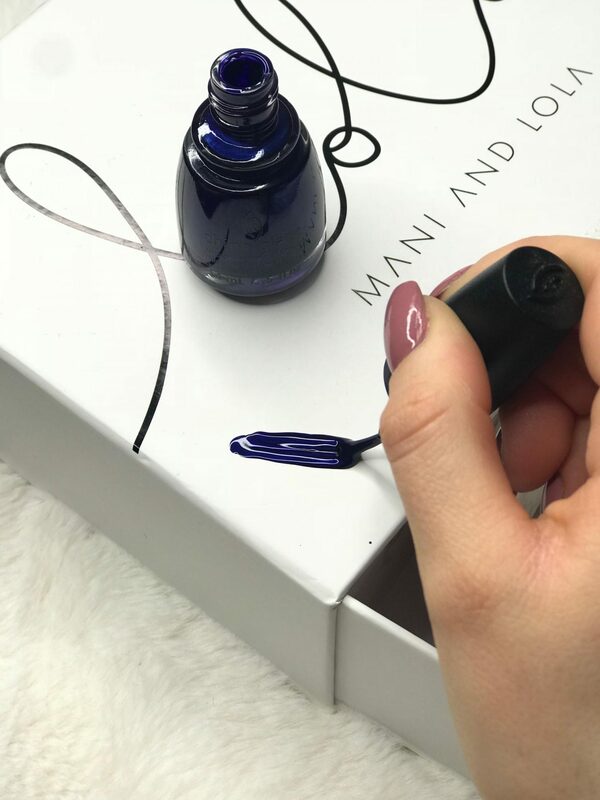 I also received these beautiful three shades, they are absolutely gorgeous nail colours and they are such long lasting luxurious polishes. I swear by all this brands! 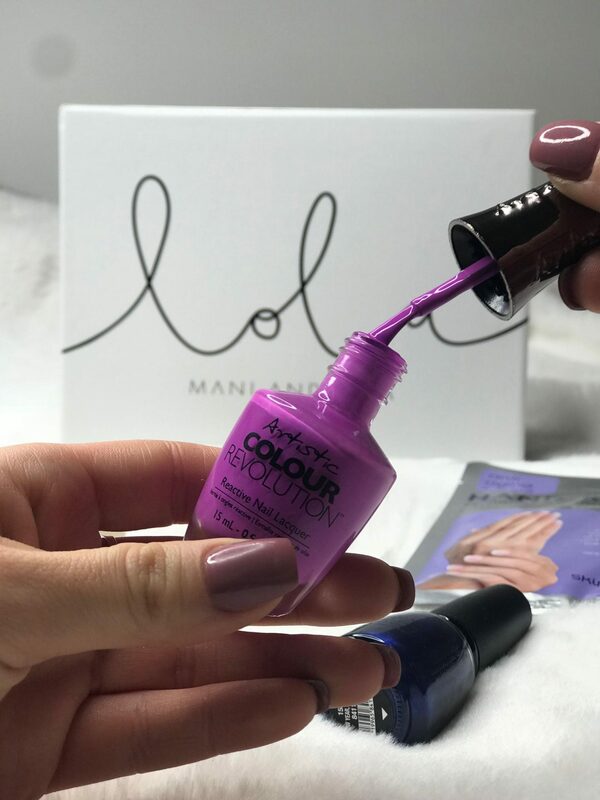 The bright purple is from Artistic Colour revolution “Shred it up”, OPI ‘Samoan Sand’ which is my new favourite colour. The colours are so striking and I couldn’t love them more! I work in retail once a week and for those of you that have done or do, you’ll understand how bad your nails can get from picking up and carrying hangers all day! 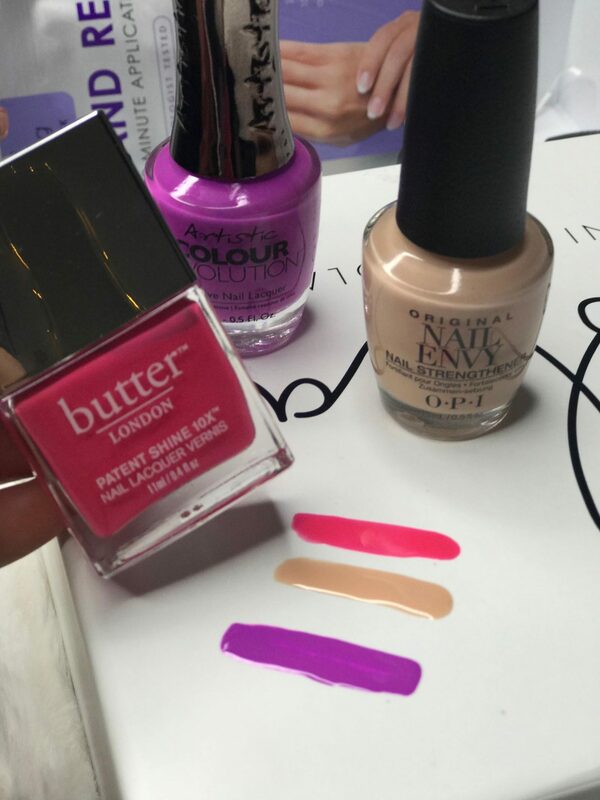 Mine end up chipping so badly, but I’ve been using these colours the last few weeks and it lasts so much longer! 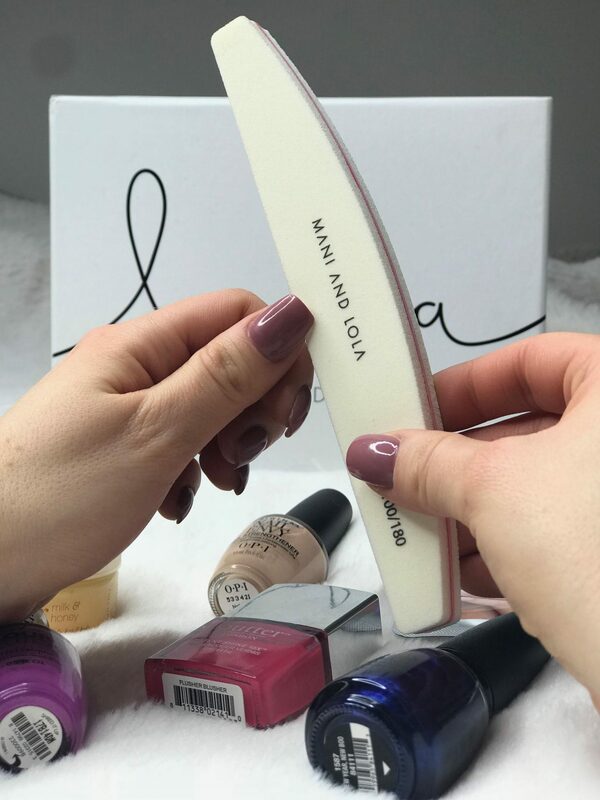 I also received the Nail Shaper within my monthly box, which is amazing for smoothing over my nails and keeping them in good condition. 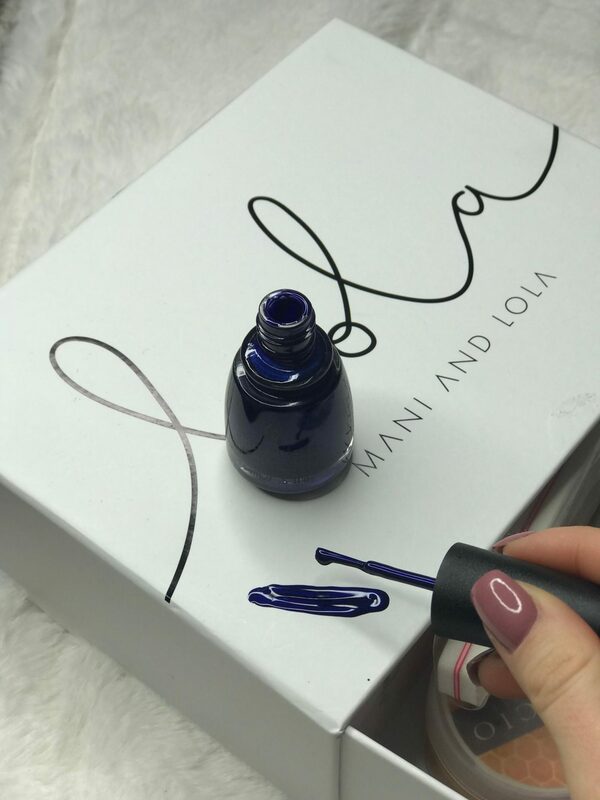 I struggle keeping my nails neat and tidy, but this is super easy to use!!! These little treat boxes are so perfect, and cheer up my months with such sweet surprise gifts! You can check out there website HERE to subscribe for some amazing surprises each month!